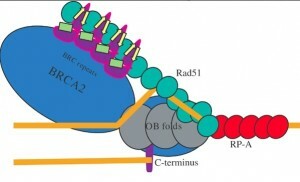 BRAC2 is a tumor suppressor gene. Its protein product interacts with other proteins to assist regulation of DNA repair, transcription and cell cycle checkpoints. BRAC2 gene disruption may lead to protein truncation, mutations and loss of function. Cellular alterations by BRAC2 gene deficiency may lead to tumorigenesis. BRAC2 has been found to be mainly involved in the early onset of hereditary breast cancers.